DuelloTV has a swordplay video instruction library unmatched anywhere in its breadth and depth. But the videos were long, hard to browse topic-by-topic, and weren’t very interactive. That’s changing. 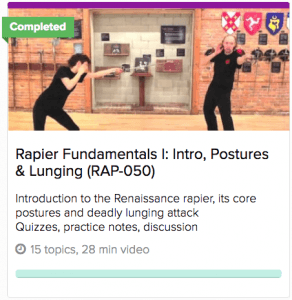 We’ve been working extremely hard behind the scenes, and today we’re proud to begin our roll-out of online swordplay courses at two levels: Premium and Basic. All of our new courses will offer bite-sized video topics from 1-3 minutes long. Track your progress as you make your way through the course, and pick up where you left off last time you visited the site. They work great on any device: phone, tablet or desktop. Basic courses contain high quality, individual step-by-step topic videos. Every course on DTV (over 50 of them!) will have a simplified basic counterpart—just the video content in topic-by-topic segments. Track your progress as you watch them all. The basic courses will be built out much faster than the premium courses, so look for new courses to be completed and ready for you often! Access all basic courses via Scholars Club or Masters Club subscription. Basic Course Packs will soon be available to allow a one-time purchase for lifetime access. We like free. That’s why we’ve always made our high quality Quick Start courses for Longsword and Rapier available to all members at no charge. If you haven’t yet tried them, jump in and see what they’re about. With video topics, quizzes and practice notes, we’re sure even experienced practitioners will get something out of them. You can also read the training blog for free. Our blog currently hosts over 230 articles on swordplay, training, tournament, teaching, motivation—pretty much anything you can image connected with studying any martial art. Subscribe for full blog archive access.